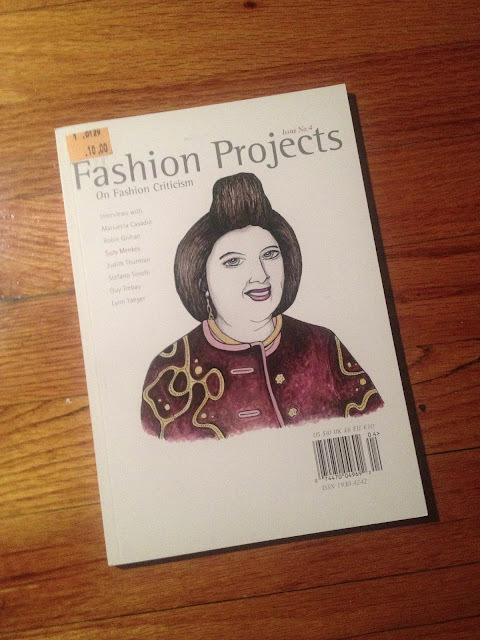 I highly recommend finding an issue of Fashion Projects Issue #4. This particular volume focuses on fashion criticism, and includes interviews with Stefano Tonchi, Suzy Menkes, Lynn Yaeger, among others of the same field. My copy is already filled with notes and post-its after rereading multiple times. And after each read the following question/answer with Robin Givhan, becomes more and more important to my relationship with fashion and blogging. Fashion Projects: We were talking about types of fashion writing and the marginalization of fashion-part of it comes from an association with femininity. You've written about the gender divide in fashion. The article that you penned on Victoria Beckham and the reception of fashion designers comes to mind. 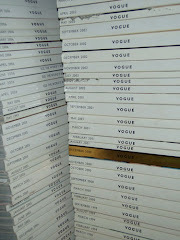 Do you think that is true of fashion writing? Do you think that gender has impacted your career or role as a writer? Robin Givhan: ...I think there is an incredible amount of sexism at play in the way the fashion industry is perceived and in the way the coverage of the fashion industry is perceived. I don't think you have to look any further than the ways in which the auto industry or sports are covered....if it is just a matter of getting from point A to point B, then you would buy a Ford Fiesta and you get there. The difference is the manner in which you want to arrive and what the kind of car you drive says about you and your appreciation for the technology of that car. All of those things can also really be said about the fashion industry. If it were just a matter of not going naked, we could all just wear Gap t-shirts, but clothes mean more then that. So every nasty comment made about French couture-where a dress could cost $25,000-we could have the same conversation about Rolls Royce...I'm just as offended by someone who could spend hundreds of thousands of dollars on a Bentley...I do think the fashion industry is a victim of terrible sexism, and it comes from both men and women. I think there a lot of women who believe that they should feign any interest whatsoever in fashion, it will deplete their IQ. Since I have never been interested in the business side of fashion, I find myself explaining fashion as my art form, my creative outlet. Which is true, but the conversation between Michelle Labrague and Givhan allowed me to admit I am attracted to the dialogue between fashion and culture. Beyond trends, fashion not only reflects personal statements, but also clique, club, or even a dynasty's outlook on society and it's members. I know its obvious but Givhan's words clicked after having the conversation with my self for years, and never understood how to put the thoughts into words. What questions or statement does your clothes make? editor....thank you so much for this link. i so enjoyed reading it. the last two paragraphs are perfect. and i especially like the ' tumblr....is detrimental because it presents dressing well as a talent in and of itself' statement. i'm taking a step back to really access these words.